Spiritual Power Love Spells can Draw Love and Affection. Lucky Mojo, Psyshic Vision will cast a spell of love. Use this daily. SONNY BOY® Come To Me Attraction (not a love spell used by magic) spiritual and religious faith oils, incense, bath wash, salt crystals, sand, bar soap, spray and spiritual faith glass jar candles. Lite a COME TO ME CANDLE. Keep it burning. Use all COME TO ME items. Write their name on a paper, and write the words, "Come To Me" after their name. Put the papers you have written on in a jar or bottle with warm water. Shake the bottle often. When the writing has come off the paper, pour the water in your bath, or over yourself. It is best if you can sprinkle some of the water where they will cross. Repeat until they are drawn to you. Anoint yourself with the water when they are near you. SONNY BOY says, always use a kit for strongest action. Use Sonny Boy Glass Jar 7-Day Candle, Sonny Boy Anoint Oil, Sonny Boy Incense Sonny Boy Bath Wash, Sonny Boy Salt Crystals or Sprinkling Sand, or Sonny Boy Anoint Spray. 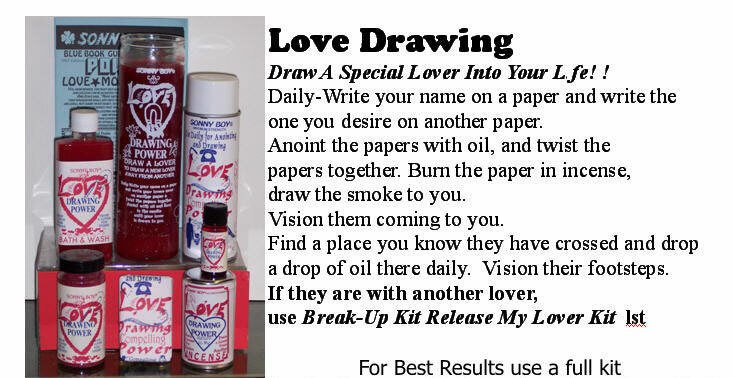 SONNY BOY® Love Drawing Power (not a witchcraft love spell) spiritual and religious faith oils, incense, bath wash, salt crystals, sand, bar soap, spray and spiritual faith glass jar candles. Love Drawing, draw a special lover into your life. Daily - write your name on a paper and write the one you desire on another paper. Anoint the papers with oil, and twist the papers together. Burn the paper in incense, draw the smoke to you. Vision them coming to you. Find a place you know they have crossed and drop a drop of oil there daily. Vision their footsteps. If they are with another lover, use Break-Up Kit Release My Lover Kit first. SONNY BOY says, always use a kit for strongest action. Use Sonny Boy Glass Jar 7-Day Candle, Sonny Boy Anoint Oil, Sonny Boy Incense Sonny Boy Bath Wash, Sonny Boy Salt Crystals or Sprinkling Sand, or Sonny Boy Anoint Spray. SONNY BOY® Come To Me Love Attraction spiritual and religious faith oils, incense, bath wash, salt crystals, sand, bar soap, spray and spiritual faith glass jar candles. Fire of Love. Start A Love Fire You Desire. Renew a Love Fire That Is Dim. Write the name on white paper, and wrap it around a match, and tie with a red string. Drop in a bottle of oil. Anoint yourself anytime you come in contact with the one you desire. Daily - lite a match and say out loud your love desire for the Fire of Love (this is not a love spell from magic, it is a spiritual faith for love). SONNY BOY says, always use a kit for strongest action. Use Sonny Boy Glass Jar 7-Day Candle, Sonny Boy Anoint Oil, Sonny Boy Incense Sonny Boy Bath Wash, Sonny Boy Salt Crystals or Sprinkling Sand, or Sonny Boy Anoint Spray. SONNY BOY® Irresistible love spiritual and religious faith oils, incense, bath wash, salt crystals, sand, bar soap, spray and spiritual faith glass jar candles. Irresistible. Your Lover Won't See Anybody But You. You Will Feel Your Lover Reaching For You! Write your name and the name of the one you desire on parchment papers. Twist the papers together, with the names facing each other. Put in Irresistible Oil. SONNY BOY says, always use a kit for strongest action. Use Sonny Boy Glass Jar 7-Day Candle, Sonny Boy Anoint Oil, Sonny Boy Incense Sonny Boy Bath Wash, Sonny Boy Salt Crystals or Sprinkling Sand, or Sonny Boy Anoint Spray. SONNY BOY® Psychic Vision spiritual and religious faith oils, incense, bath wash, salt crystals, sand, bar soap, spray and spiritual faith glass jar candles. Psychic Vision can show you any threat to you or your family. We are always better to know who we can trust, and who we cannot trust. Draw a circle on white paper. Put the Psychic Vision Candle in the circle. Pray there daily, and your vision and perceptions will be strongest. The circle is a symbol of purity and protection. Psychic Vision will help you make decisions. SONNY BOY says, always use a kit for strongest action. Use Sonny Boy Glass Jar 7-Day Candle, Sonny Boy Anoint Oil, Sonny Boy Incense Sonny Boy Bath Wash, Sonny Boy Salt Crystals or Sprinkling Sand, or Sonny Boy Anoint Spray. Sonny Boy is the #1 supplier of spiritual products and botanica. Strong! Dependable! Sonny Boy spiritual product's ancient recipes for incense and oils are the most powerful. Burn Sonny Boy Novena Alter Candles allow your prayers to communicate your need for God's blessings. Sonny Boy Spiritual Products have drawing powers not found in any other product. Come to Me and Love Drawing products will draw the one you desire like bee to honey. Sonny Boy provides the drawing power that lets you be in control of your life. Use Sonny Boy Irresistible and Fire of Love products to enhance a relationship that is dim. Thousands rely on Sonny Boy Psychic Vision products to allow them to know the truth of those around them. We make better decisions when we know the truth. Burn Sonny Boy Novena Candles, use the incense and oils and other items in the kits. You will draw the blessings you need.